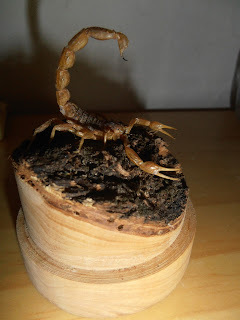 Rats on the washing line, bat in the bathroom, scorpion behind the bedside table, dried centipede under the bed, snakes in the house and a compost bag full of worms had me thinking I'd got this nature stuff under my belt. Living in the olive groves after all these years (17) no problem, no squeals - anymore (she thinks). So just as I sit on the patio with a glass in hand (water - only 5.30,) after a spectacular thunder and lightening storm in the morning, admiring the weed garden on the roof, an army of massive ants came into my vision tightrope walking the washing line. Up and down the wooden pegs, around the plastic ones. Then, to add to the invasion of my water break, a snake poked out from under a roof tile and headed down the wall of the house. 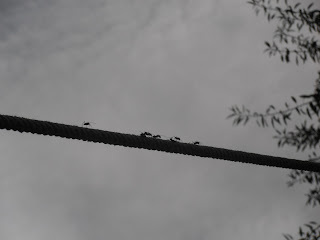 Maybe if I had a normal washing line instead of taking over the rope straddling the almond and walnut tree originally as an aerial runway and swing for the boys then rats and ants may not run across a thin slippy nylon line. Now moving beasts I can see are ok-ish, but now I've another paranoia. The snake left his roost right above my back door. How long's it gonna take me to leave the house without looking up first? I'm wishing I'd never seen the thing. Son no.1 just shrugged when I told him how close to his bedroom window it was. He has no netting up, then he doesn't seem to mind beasts like this in his room. Oh the joys and horrid bits about country living that I wouldn't change for anything. Except a little less wild life perhaps.